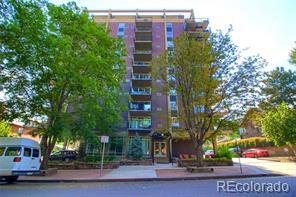 Stylish 2bd/2bth Cheesman Park Condo w/ open layout, natural light, balcony, deeded parking & laundry. Complete building remodels in 2010, tastefully updated w/ slab granite, custom cabinets, pendant lighting, stainless appliances, wood floors & designer paint. Spacious master suite w/ walk-in closet. Pride of ownership & a pleasure to show! Walk to the park, Botanic Gardens, Cherry Creek, 12th Avenue shops & more!